Def Leppard have announced a new show in Temecula, California for 2nd November at a Casino resort. 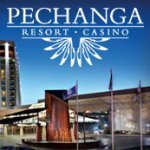 The concert is at Pechanga Theater at Pechanga Resort and Casino venue and tickets go on sale 16th August. This is one of a "weeks worth of shows" mentioned by Joe during a recent radio interview. The venue has a capacity of just 1,200. It would appear that the band are playing all these new shows at similar venues.